On September 25, 2011, thousands of police officers converged on Parliament Hill in Ottawa, Canada for the 14th Annual Police and Peace Officers' Memorial Day. 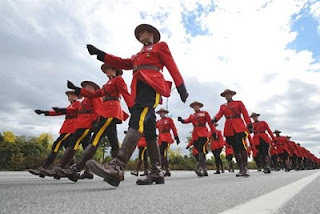 In 1998, the Canadian Government declared the last Sunday of every September as Canadian Police and Peace Officers' Memorial Day. The Memorial service is similar to our May 15th National Peace Officers Memorial Day, celebrated each year in the United States during National Police Week. According to a statement from Public Safety Minister Vic Toews, "The Canadian Police and Peace Officers' Annual Memorial Service gives Canadians an opportunity to formally express their appreciation for the dedication of police and peace officers, who contribute so much to keeping our communities safe and to those who have paid the ultimate price." The Canadian Memorial now contains the names of over 800 fallen officers. A total of 51 names were added to the Memorial in 2011, including the four officers listed above and the names of 47 officers from historical cases, with 43 of those officers from the Province of Quebec. More information about the Canadian Police Memorial is available at: http://www.cacp.ca. In about a month, Detective Gene Fox will make the long journey from the state of Texas to Washington, DC to participate in the Law Enforcement Ride & Run to Remember on October 16, 2011. Watch the video below to hear why Det. Fox decided to participate in this event and why you should join him in honoring all of America's law enforcement heroes by registering for the Ride & Run today. Today, at the National Law Enforcement Officers Memorial in Washington, DC, we honored the 72 American peace officers killed tragically on September 11, 2001. Attorney General Eric H. Holder, Jr., gave the keynote speech and was joined by FBI Director Robert Mueller, United States Secret Service Director Mark Sullivan, United States Park Police Chief Teresa Chambers, Former Chief of the Port Authority of NY & NJ Police Department Joseph Morris, and Port Authority Officers Cesare Morales and Paul Nunziato in reading the names of all 72 officers killed that day. "Because of them, the anniversary we observe every September 11th will always be about far more than the buildings that our enemies brought down, or the damage that they inflicted on our fellow citizens. It’s about honoring the heroism we witnessed on that fateful day – and the resilience that the American people have shown since,"said Attorney General Holder. "Let this be our commitment to those we honor this morning – the 72 brave individuals whose names are etched, along with more than 19,000 others, into the walls of this memorial. Let us carry on their unfinished work and strive – in their honor – to promote, not only safety and security, but also peace – and, above all, justice. And – as we leave this place today – let us do everything in our power to ensure that – in our own time, in the lives of our children, and in the work of future generations – the stories, the memories, and the rich legacies of those we lost on September 11th will never be forgotten," he concluded. Special thanks to United States Capitol Police Officer Melissa Recchuiti Gibson, Officer Mike McCann of the Virgina State Police, and Captain Kathy Harasek for their participation in today's ceremony. To view the full text of the Attorney General's speech from today, visit http://www.nleomf.org/newsroom/speeches/attorney-general-eric-holder.html.